aFrom the Department of Neuroradiology, Saarland University Hospital, Homburg, Germany. BACKGROUND AND PURPOSE: Mechanical thrombectomy with stent retrievers in acute stroke has emerged as a promising new technique, with the highest recanalization rate of the therapeutic procedures available thus far. However, in up to 20% of the cases, mechanical thrombectomy with stent retrievers results in poor angiographic outcomes, with Thrombolysis in Cerebral Infarction scores ≤2a. The purpose of this study was to investigate whether thrombus attenuation on the initial CT scan can predict the angiographic outcome of the recanalization procedure in MCA occlusions. MATERIALS AND METHODS: The data of 70 patients with acute MCA occlusions who underwent endovascular treatment with stent retrievers in our department were included. We analyzed thrombus attenuations, angiographic outcome, and periprocedural thrombus fragmentation. RESULTS: The mean thrombus attenuation was 49.8 ± 7.8 HU and the mean difference from the attenuation of the contralateral MCA was 9.9 ± 8.0 HU. There were no significant differences in the thrombus attenuations of occlusions that were successfully recanalized (modified Thrombolysis in Cerebral Infarction ≥2b) and those that were not. Neither were there significant correlations of thrombus attenuations and periprocedural thrombus fragmentations that occurred in 64.3%. We found a nonsignificantly higher rate of recanalizations with modified Thrombolysis in Cerebral Infarction ≥2b when the difference from the attenuation of the contralateral MCA was between 1–20 HU. CONCLUSIONS: In contrast to results of other revascularization procedures as published in a recent study, the angiographic result of mechanical thrombectomy with stent retrievers is not predicted by thrombus attenuation. In the last 2 years, endovascular treatment of acute intracerebral artery occlusions received impetus through a new technique that uses fully retrievable self-expanding stents. With the use of these stent retrievers, several studies have reported recanalization rates with TICI ≥2b from 79–90%.1⇓⇓⇓–5 However, in up to 20% of cases, mechanical thrombectomy with stent retrievers results in poor angiographic outcomes, with TICI scores ≤2a. To explore whether thrombus attenuation on the initial CT scan can predict the angiographic outcome of mechanical thrombectomy with stent retrievers, we performed a retrospective analysis of patients with acute MCA occlusions who have been treated with stent retrievers in our department. Between October 2009 and October 2012, 89 patients with acute occlusions of the M1 segment of an MCA underwent mechanical recanalization with stent retrievers in our department. The data of 19 of these patients were excluded from analysis because the initial CT scans were not performed in our department but at the external referring hospitals (n = 17), because of a high contrast artifact at the occluded MCA (n = 1), and because of an initial MRI scan instead of a CT scan (n = 1). The data of 70 patients were included (37 male, 33 female; mean age, 72 ± 12 years). The imaging protocol for patients with suspected stroke in our department consists of a NCCT, followed by CT angiography and CT perfusion scans. NCCT scans were performed on an Aquilion 32-section CT scanner (Toshiba Medical Systems, Tokyo, Japan) in helical mode (0.5-mm thickness, 120 kV) and reconstructed in the axial, sagittal, and coronal planes (5-mm thickness). Patients meeting the following criteria were selected for endovascular therapy: 1) neurologic examination demonstrated a significant neurologic deficit (paresis of arm or leg, aphasia, dysarthria), 2) intracranial hemorrhage and established infarction were excluded by NCCT, 3) CT angiography confirmed major vessel occlusion. Procedures were performed on a biplane angiography machine (Axiom Artis; Siemens, Erlangen, Germany) as described before.1 Stent retrievers used were Solitaire FR (Covidien, Irvine, California), pREset (Phenox, Bochum, Germany), Trevo (Stryker, Kalamazoo, Michigan), and Aperio (Acandis, Pforzheim, Germany). Balloon guide catheters for the recanalization procedures were not used. Thirty-six patients were administered IV thrombolysis before endovascular therapy. Thirty-four patients were treated only endovascularly because of contraindications against IV thrombolysis. Angiograms and CT scans were analyzed retrospectively by 2 raters in consensus, and angiographic results were scored according to the modified TICI (mTICI) score.7 A thrombus was considered fragmented when its shape and/or length changed in the angiogram after a recanalization maneuver. Thrombus attenuations and attenuations of the contralateral MCA were measured in manually placed regions of interest perpendicular to the vessel on sagittal reconstructions of the CT scans. To take individual baseline blood attenuation into account for statistical analysis, the difference of the thrombus attenuations and the attenuations of the contralateral MCA were calculated (referred to as ΔTM). Statistical analysis was performed with the use of PASW 17.0 (IBM, Armonk, NY). The χ2 test was applied to determine differences in frequencies. Differences in means were tested by means of Student t test. Recanalization with mTICI ≥2b was achieved in 57 cases (81.4%). For the group of patients who were treated by combined IV rtPA and mechanical thrombectomy, this rate was 80.6%; for the group treated only by mechanical thrombectomy, the rate was 82.4% (P = .847). The mean thrombus attenuation was 49.8 ± 7.8 HU, and the mean attenuation of contralateral MCA was 39.9 ± 5.0 HU, with a mean difference (ΔTM) of 9.9 ± 8.0 HU (P < .001; 95% CI, 8.0–11.8). In 5 cases (7.1%), the attenuations of the contralateral MCAs were higher than those of the clots (resulting in a negative ΔTM). Thrombus attenuations and ΔTMs were significantly higher in patients who had additional proximal occlusions of the extracranial ICA that were treated by stent placement first to obtain access to the MCA occlusion (Table 1). As shown in Table 2, there were no significant differences in the thrombus attenuations of occlusions that were successfully recanalized (mTICI ≥2b) and those that were not. Neither was there a significant difference when ΔTMs were compared instead of thrombus attenuations alone. Periprocedural thrombus fragmentation occurred in 45 (64.3%) cases. Again, there was no significant correlation with thrombus attenuations (Table 3). To test for a nonlinear relation, we subdivided attenuations and values of ΔTM into steps of 10 HU and compared recanalization rates (Fig 1). Although there were no differences between the groups when comparing absolute attenuations of the clots (data not shown), we found a nonsignificantly higher rate of recanalization mTICI ≥2b when values of ΔTM were 1–20 HU (84.5% versus 66.7%, P = .149). This tendency increased in the group of patients who were treated by combined IV rtPA and mechanical thrombectomy (86.2% versus 57.1%, P = .081) and disappeared in the group of patients who were treated by mechanical thrombectomy only (82.8% versus 80.0%, P = .881). Recanalization rates for groups of different ΔTM values. In this study, we investigated whether differences in thrombus composition, as far as detectable by different attenuations on CT scans, influence angiographic results of mechanical thrombectomy with stent retrievers. Mechanical thrombectomy with stent retrievers has been shown to result in the highest recanalization rates in acute intracerebral vessel occlusions reported thus far.1⇓⇓⇓–5 However, up to 20% of the cases result in poor angiographic outcome (TICI ≤2a). Very recently, Moftakhar et al6 reported significant correlations of preinterventional thrombus attenuations and recanalization results for IV rtPA, intra-arterial rtPA, and mechanical treatments with the Merci and Penumbra devices. In their study, cases with lower HU values of the clots on initial CT scans had poorer angiographic outcomes. In our study, we did not find significant differences in the thrombus attenuations of occlusions that were successfully recanalized (mTICI ≥2b) and those that were not successfully recanalized. Neither were there significant correlations of thrombus attenuations and periprocedural thrombus fragmentations. Recently, the randomized Stroke Warning Information and Faster Treatment (SWIFT) trial has reported a significantly higher recanalization rate of mechanical thrombectomy with the Solitaire stent retriever compared with the Merci device.8 Our results indicate that this higher performance of stent retrievers might in part be due to an insensibility of stent retrievers to different clot compositions. However, in 5 cases, ΔTM was negative because the attenuations of the contralateral MCAs were higher than those of the clots, and we found a nonsignificant yet interesting higher recanalization rate in cases treated with combined IV rtPA and mechanical thrombectomy when ΔTM was between 1–20 HU. This observation might be explained by a lower performance of stent retrievers on clots of a very lipid-rich composition, but it must be readdressed in studies with larger case numbers. Furthermore, we found that the mean thrombus attenuation is significantly higher in cases with additional proximal extracranial ICA occlusions. This information may be of value in centers in which CT angiography is not implemented in the stroke-imaging protocol. Our study has some limitations. First, for all differences that were found between patients who were administered IV rtPA and those who were not administered IV rtPA, it has to be taken into account that these 2 groups of patients are substantially different. Patients who were not administered IV rtPA were either out of the time window for IV thrombolysis or had other serious contraindications against IV thrombolysis that might have affected the parameters that we investigated as well. 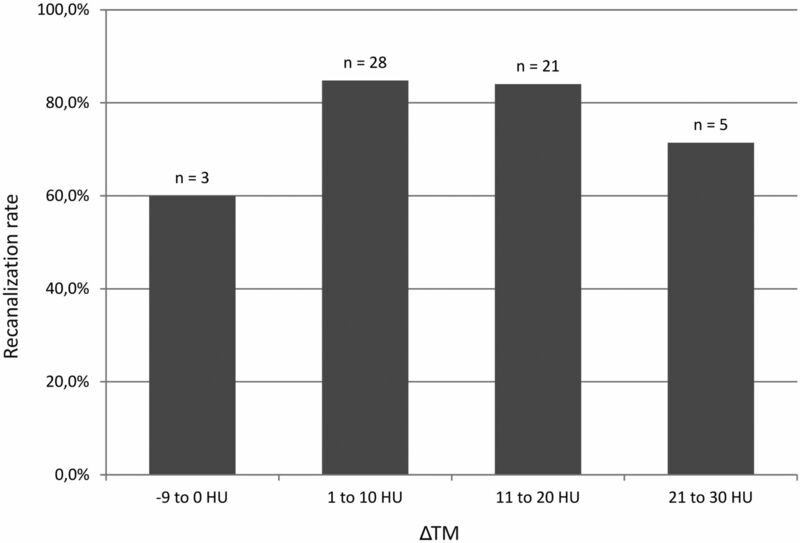 In addition, the number of cases is relatively small when considering that the group of cases with values of ΔTM outside the range from 1–20 HU who showed differences in the rate of recanalization consisted of only 12 patients. The significance of this difference must be re-evaluated in larger studies. In contrast to results of other revascularization procedures as published in a recent study,6 the angiographic result of mechanical thrombectomy with stent retrievers is not predicted by thrombus attenuation. This might indicate that higher performance of stent retrievers is in part due to an insensibility of stent retrievers to different clot compositions. Yet, when IV rtPA and mechanical thrombectomy are combined, there is a nonsignificant difference in the rate of successful recanalization, which must be re-evaluated in larger studies. Accepted after revision February 14, 2013.